Allan block’s built-in features make retaining walls easy to engineer and simple to build. These simple engineering features make Allan Block retaining wall systems the most efficient and reliable product in the market. With over 16 million square feet of Allan Block installed world-wide, we can provide the experience and support to make your next wall a success. Wall Tag supplies Retaining Walls all across Singapore. For quotation request, kindly contact us now. An endless array of design possibilities can be achieved with Allan Block. A single block shape allows you to build fluid curves, perfect corners, angle, steps and beautiful straight walls. Allan block is available off the shelf in grey. A rainbow of additional colours is available on request. Allan Block is a mortarless, stackable, concrete block retaining wall system. The patented interlocking lip automatically locks each row of blocks in place as they are stacked. With mortarless construction technique, Allan Block system requires no grouting, no mortar and no concrete footing. The inherent benefits include site adaptability, installation by general labours and lower cost. The shear strength of the raised front lip at near 2000 pounds per running foot. Consolidated granular infill in the hollow core. 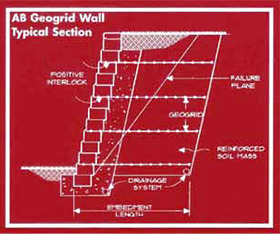 When wall heights exceed those listed in the gravity wall chart, Tensar geogrid can be added to provide a stable wall conditions. Layers of Tensar geogrid inserted between the blocks and extending behind the wall interlock with the surrounding soil to create a solid soil mass. This mass uses its own weight and internal shear strength to resist both the sliding and the overturning pressures from the soil being retained. The granular material in the Allan Block cores provide a positive connection between the layers of Tensar geogrid and the Allan Block wall, locking the two systems together. The reinforced soil mass becomes the structure and the Allan Block wall becomes the facing. The specific location and embedment length of the grid layers depends upon the site conditions. Wall heights and Long-Term Allowable Design Strength of the grid being used. Allan Block’s gravel filled hollow core provides a multi-point interlock with the grid. As wall heights increase, our exclusive ‘rock lock’ connection, combined with the weight of the Allan Block units, provides the best block- to-grid interlock of any system in the market. The hollow-core design combines with mortarless construction to allow water to drain freely from behind the wall. A vertical ‘drained field’ is formed by the layer of crushed rock placed behind the block and in the block cores. Water moves easily down the drained field. This excellent built-in drainage system prevents any major buildup of hydrostatic pressure.